Recently, we identified that regulation of leukocyte recruitment by IL-6 requires shedding of the IL-6R from infiltrating neutrophils. In this study, experiments have examined whether other IL-6-related cytokines possess similar properties. Levels of oncostatin M (OSM) and leukemia inhibitory factor were analyzed in patients with overt bacterial peritonitis during the first 5 days of infection. Although no change in leukemia inhibitory factor was observed throughout the duration of infection, OSM was significantly elevated on day 1 and rapidly returned to baseline by days 2–3. The source of OSM was identified as the infiltrating neutrophils, and OSM levels correlated both with leukocyte numbers and i.p. soluble IL-6R (sIL-6R) levels. FACS analysis revealed that OSM receptor β expression was restricted to human peritoneal mesothelial cells. Stimulation of human peritoneal mesothelial cells with OSM induced phosphorylation of gp130 and OSM receptor β, which was accompanied by activation of STAT3 and secretion of CC chemokine ligand 2/monocyte chemoattractant protein-1 and IL-6. Although OSM itself did not modulate CXC chemokine ligand 8/IL-8 release, it effectively suppressed IL-1β-mediated expression of this neutrophil-activating CXC chemokine. 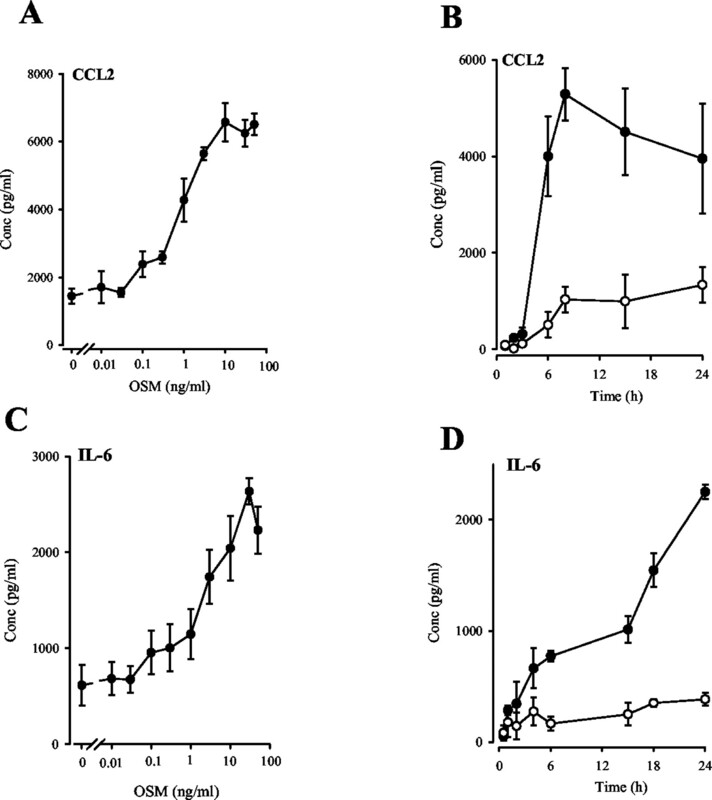 Moreover, OSM synergistically blocked IL-1β-induced CXC chemokine ligand 8 secretion in combination with the IL-6/sIL-6R complex. Thus suggesting that OSM and sIL-6R release from infiltrating neutrophils may contribute to the temporal switch between neutrophil influx and mononuclear cell recruitment seen during acute inflammation. Oncostatin-M (OSM)3 is a 28-kDa glycoprotein that belongs to the IL-6 family of cytokines (1, 2). Although originally identified through its capacity to inhibit melanoma cell replication (3), recent studies have shown OSM to be a potent modulator of inflammation (4, 5, 6, 7). Consistent with the inflammatory properties of IL-6, OSM exhibits both pro- and anti-inflammatory characteristics (8, 9, 10, 11, 12). Several reports have documented clear distinctions in the cellular origin and profile of OSM expression in various disease states (6, 8, 9, 13). For example, in acute lung injury OSM was transiently secreted by infiltrating neutrophils (13), whereas OSM levels in synovial fluid from rheumatoid arthritis patients were more sustained (9) and originated from activated macrophages and T lymphocytes (6, 8). Consequently, OSM may elicit distinct events during acute and chronic inflammation, which may relate to the pro- and anti-inflammatory characteristics of this cytokine. Recurrent bacterial peritonitis is a principle cause of treatment cessation in end-stage renal failure patients undergoing continuous ambulatory peritonitis dialysis (CAPD). This condition provides a unique opportunity to study the cytokine network in a human inflammatory process (14, 15, 16, 17). As with other inflammatory diseases, the profile of leukocyte recruitment encountered during peritoneal infection is critical to the outcome of the condition and is characterized by an initial influx of neutrophils that are rapidly replaced by a more sustained population of mononuclear leukocytes (14, 15). This temporal switch in leukocyte phenotype is central to the resolution of an inflammatory episode, and regulation of this event ultimately depends upon communication between invading leukocytes and the mesothelium (14, 18). Recently, we identified that soluble IL-6R (sIL-6R) shed from infiltrating neutrophils combines with mesothelial-derived IL-6 to differentially control chemokine expression and regulate the pattern of leukocyte recruitment (17). This scenario has subsequently been supported by an in vitro study based on the activation of endothelial cells by IL-6 and its soluble receptor (19). In this current study, we show that raised i.p. levels of OSM during bacterial infections originate from infiltrating neutrophils and regulates mesothelial expression of IL-6 and inflammatory chemokines. Ultimately, the regulation of these factors by OSM may directly effect leukocyte recruitment during inflammatory episodes. Human recombinant OSM was purchased from Autogen Bioclear (Calne, U.K.) and R&D Systems (Abingdon, U.K.). Human recombinant IL-1β, IL-6, CC chemokine ligand (CCL)2, CXC chemokine ligand (CXCL)8, CXCL10, CCL5, CCL3, and the anti-gp130 mAb (MAB-230) were obtained from R&D Systems. All cell culture supplements and media were from Life Technologies (Paisley, U.K.). Primary Abs against OSM receptor β (OSMRβ) (AN-A2), leukemia inhibitory factor (LIF) receptor (AN-E1), gp130 (H-255), STAT1 (M-22), and STAT3 (C-20) were from Santa Cruz Biotechnology (Santa Cruz, CA). The phosphotyrosine Abs 4G10 and PY-20 were from Upstate Biotechnology (Lake Placid, NY) and Santa Cruz Biotechnology, respectively. Control and conjugated secondary Abs were from DAKO (Ely, U.K.). The m67 SIE consensus oligonucleotide was synthesized by Life Technologies and the [α32P]dTTP obtained from Amersham Pharmacia Biotech (Amersham, U.K.). All other chemicals were purchased from Sigma-Aldrich (Poole, U.K.). Prof. S. Rose-John (Institüt für Biochemie, Christian-Albrecht-Universität zu Kiel, Kiel, Germany), kindly provided HYPER-IL-6. Dialysis effluent was collected from end-stage renal failure patients currently being treated at the University Hospital of Wales (Cardiff, U.K.) in accordance with ethical approval from Bro Taf Health Authority. A uniform protocol for patient management was adopted and details are described elsewhere (17). The collected effluent was centrifuged and supernatants frozen at −80°C until required. Neutrophils or macrophages were directly isolated from the cellular fraction and used immediately. Peritoneal neutrophils were isolated from dialysis fluid collected on day 1 of infection using established methods (17). Differential cell counts confirmed that the neutrophil population represented 84 ± 3% of the total cell count. Peritoneal macrophages were isolated from dialysis fluid collected from noninfected (overnight dwell) patients (20). Macrophages constituted 52 ± 5% of the cell population, whereas neutrophils represented <5% of the total cell count. Neutrophils (105 cells/ml) and macrophages (105 cells/ml) were incubated in RPMI medium containing penicillin and streptomycin for 24 h at 37°C, 5% CO2. Neutrophils were incubated in the presence or absence of 1–10 μM hydrocortisone, whereas macrophages were stimulated with a defined dose of cell-free supernatant derived from Staphylococcus epidermidis, which is a major causative organism in dialysis-related episodes of peritonitis (17, 20). Culture supernatants were rendered cell-free by centrifugation and stored at −80°C. HPMCs were isolated as previously described (18). Briefly, omental tissue from consenting patients undergoing abdominal surgery was digested with 0.1% (w/v) trypsin/0.02% (w/v) EDTA diluted in PBS. Cells were cultured in Earle’s buffered-199 medium containing 10% FCS, 2 mM l-glutamine, 100 U/ml penicillin, 100 μg/ml streptomycin, 5 μg/ml transferrin, 5 μg/ml insulin, and 0.4 μg/ml hydrocortisone at 37°C in a humidified atmosphere containing 5% CO2. HPMC monolayers were growth arrested for 48 h in the absence of FCS before stimulation. Under these conditions, HPMCs remain in a viable and quiescent state for up to 96 h (18). All experiments were performed in the absence of FCS on isolates no older than the second passage. 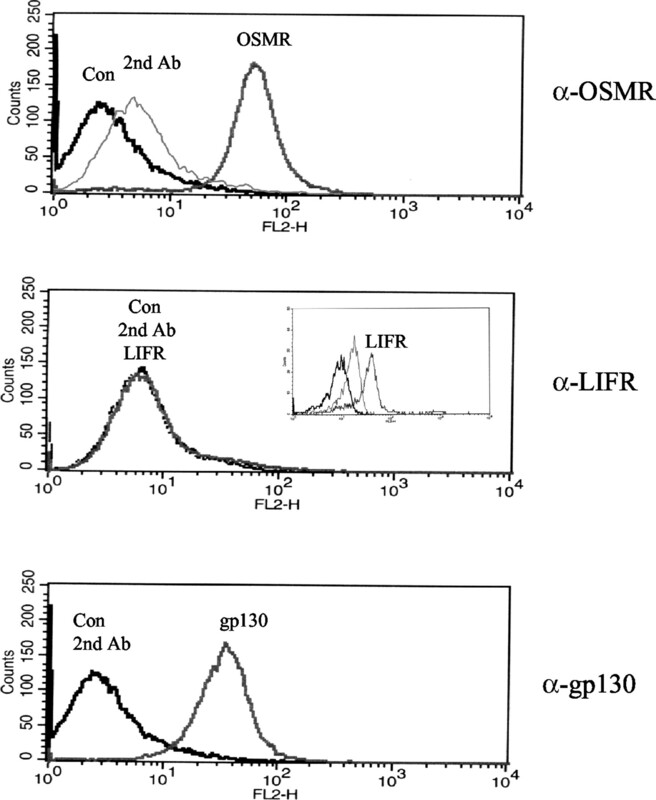 Cellular expression of OSMRβ, LIFR, and gp130 was analyzed using flow cytometry (FACSCalibur; BD Biosciences, Cowley, U.K.) and primary Abs specific for the extracellular portion of OSMRβ, LIFR, and gp130 (MAB-230). Ab labeling was detected with either PE-tagged anti-mouse IgG or nonspecific rabbit IgG and compared with cells labeled with secondary PE-conjugated Abs alone. Data were acquired from 10,000 gated events per sample. HPMC monolayers (75-mm2) were stimulated with OSM (10 ng/ml), HYPER-IL-6 (50 ng/ml), or medium alone for 30 min at 37°C in a humidified 5% CO2 incubator. Cells were washed with ice-cold saline and lysed with RIPA buffer (50 mM Tris-HCl (pH 7.5), 100 mM NaCl, 50 mM NaF, 3 mM sodium orthovanadate, and a mixture of protease inhibitors) containing 1% (v/v) Nonidet P-40. Lysates containing ∼2 mg of protein were precleared with 100 μl (50% slurry in RIPA buffer) protein A-conjugated Sepharose (Amersham Pharmacia Biotech) for 2 h at 4°C. The supernatant was incubated overnight at 4°C with 2 μg/ml polyclonal anti-gp130 Ab (C-20; Santa Cruz Biotechnology) and immune complexes recovered by addition of 50 μl protein A-conjugated Sepharose. Samples were washed in RIPA buffer and finally solubilized in 62.5 mM Tris-HCl (pH 6.8) containing 2% (v/v) SDS, 0.05% (w/v) bromophenol blue for analysis by Western blotting. Immunoprecipitated proteins were separated under reducing conditions in a 7.5% SDS-polyacrylamide gel and electroblotted onto Hybond-P membrane (Amersham Pharmacia Biotech). For analysis of gp130, proteins were separated under nonreducing conditions. Membranes were blocked with 5% (w/v) BSA/PBS containing 3 mM sodium orthovanadate for 2 h at room temperature, and probed with either a mixture of two monoclonal phosphotyrosine Abs (2 μg/ml PY-20 and 1 μg/ml 4G10) or 2 μg/ml rabbit polyclonal anti-gp130 (H-255). Membranes were washed and incubated for 1 h at room temperature with HRP-conjugated anti-mouse or anti-rabbit IgG (DAKO). Immunolabeled proteins were visualized by ECL (SuperSignal; Pierce, Rockford, IL). To detect OSMRβ, the membrane was stripped with 62.5 mM Tris-HCl (pH 6.8), 2% (w/v) SDS, and 100 nM 2-ME for 30 min, blocked overnight with 5% (w/v) BSA. Blots were then probed with 2 μg/ml anti-OSMRβ (AN-A2). HPMC monolayers (75 mm2) were stimulated with 10 ng/ml OSM as indicated in Fig. 3⇓, B and C. Cells were washed with ice-cold PBS and collected by gentle scrapping. Nuclear extracts were prepared using a rapid technique for the extraction of DNA-binding proteins. Briefly, isolated cells were resuspended in cold buffer A (10 mM HEPES-KOH (pH 7.9), 1.5 mM MgCl2, 10 mM KCl, 0.5 mM DTT, 0.2 mM PMSF) and allowed to swell on ice for 10 min. The cells were vortexed and centrifuged. The pellet was resuspended in 50 μl of buffer B (20 mM HEPES-KOH (pH 7.9), 25% (v/v) glycerol, 420 mM NaCl, 1.5 mM MgCl2, 0.2 mM EDTA, 0.3 mM DTT, 0.2 mM PMSF) and incubated on ice for a further 20 min. The supernatant was separated from the cellular debris by centrifugation and stored at −80°C until required. EMSA were performed as described previously (21). Oligonucleotides containing a STAT-consensus binding motif (SIE-m67, 5′-cgaCATTTCCCGTAAATCG-3′ and 5′-cgaCGATTTACGGGAAATG-3′) were annealed for use in EMSA. These double-stranded fragments were radiolabeled with [α-32P]-dTTP using the Klenow fragment of DNA polymerase I. Specific STAT/DNA complex was identified by supershift using anti-STAT1 (M-22) or anti-STAT3 (C-20) polyclonal Abs. Cytokine levels were quantified using sandwich ELISA techniques. Human OSM, LIF, IL-6, sIL-6R, CXCL8, CXCL10, CCL5, and CCL3 levels were determined using matched Ab pairs from R&D Systems. Human CCL2 was monitored using a matched Ab pair OptEIA kit from BD Biosciences. Results were analyzed using unpaired Student t test or one-way analysis of variance. Analysis of regression fit presented (see Figs. 1⇓B and 7A) were determined using MINITAB statistical analysis package. OSM levels in peritoneal dialysis effluent obtained from CAPD patients with peritoneal bacterial infections. A, ELISA was used to measure OSM and LIF levels in supernatants separated from peritoneal fluid collected from end-stage renal failure patients undergoing CAPD. Samples were collected over the first 5 days postperitoneal infection (1 ,2 ,3 ,4 ,5 ). Results are displayed as a scatter graph and represent the OSM expression pattern for 10 individual patients. In addition, no significant increase in OSM was detected in the dialysis fluid from noninfected patients (10 ± 5 pg/ml). B, Leukocyte numbers measured within the cellular fraction of the dialysis effluent were correlated with the OSM concentration measured within 24 h from the onset of infection. The MINITAB statistical analysis package was used to analyze the regression fit (∗, p < 0.01). C, Neutrophils isolated from dialysis fluid (day 1 postinfection) were cultured for 24 h in the absence or presence of 1 or 10 μM hydrocortisone. ELISA measured levels of OSM in the supernatant. Results are the mean ± SEM of three individual experiments, where ∗, p < 0.01 indicates a significant difference from OSM expression in neutrophils over 24 h.
Peritoneal effluent was obtained from dialysis patients with defined episodes of peritonitis over the first 5 days of infection and from the same individuals 3–6 mo postinfection. Consistent with the profile of IL-6 expression (17), OSM levels were significantly elevated within the first 24 h of diagnosis and rapidly decreased to the limit of detection by days 2–3 (Fig. 1⇑A). In contrast, i.p. LIF concentrations were barely detectable throughout the 5-day period. Intraperitoneal OSM concentrations were found to correlate (r = 0.83, p < 0.01) with the degree of neutrophil infiltration (Fig. 1⇑B), emphasizing that neutrophils are either the primary source of OSM, or that OSM influences their recruitment. To determine the source of OSM, neutrophils were isolated from dialysis fluid collected on day 1 of infection and cultured overnight in the absence of serum. As shown in Fig. 1⇑C, neutrophils actively secrete OSM, and this release could be blocked by inclusion of hydrocortisone, suggesting the involvement of an inflammatory signal. In contrast, isolated peritoneal macrophages and mesothelial cells were found not to release OSM, while OSM secretion by these cells was not induced by a cell-free supernatant derived from S. epidermidis (a bacterial peritonitis pathogen) or proinflammatory cytokines (IL-1β/TNF-α; data not shown). 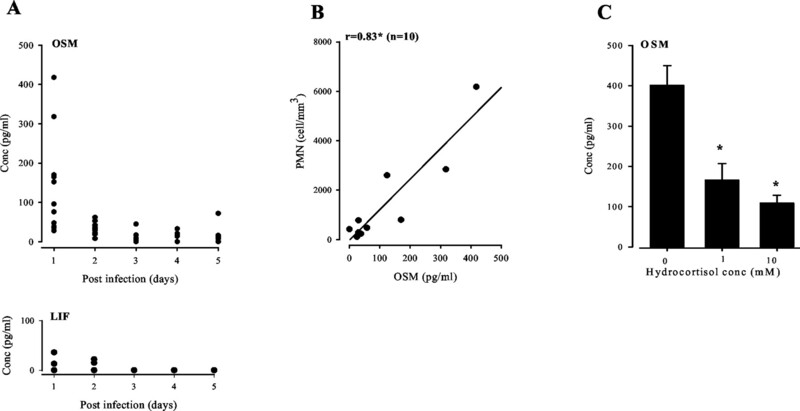 The elevation of OSM in dialysis fluid during peritonitis suggests that this cytokine may perform a regulatory role during the inflammatory response. OSM elicits its biological effects through binding either a cognate LIFR or specific OSM receptor OSMRβ, which heterodimerize with gp130 to initiate a signaling event (22, 23). To characterize expression of these receptors, FACS analysis was performed on HPMCs using specific Abs. As illustrated in Fig. 2⇓, HPMCs express gp130 and the cognate OSMRβ, but no LIFR. Although neutrophils and mononuclear leukocytes showed no expression of LIFR or OSMRβ, low levels of LIFR were detected on lymphocytes (data not shown). These data suggest that within the context of peritoneal infection, mesothelial cells are the likely responders to OSM. OSM site of action in peritoneal mesothelium. Isolated HPMCs were labeled with 2 μg/ml primary monoclonal mouse Abs, α-OSMRβ, α-gp130, or polyclonal rabbit α-LIFR, followed by secondary Abs, PE-conjugated anti-mouse or tetramethylrhodamine isothiocyanate-conjugated anti-rabbit, respectively. The inset histogram shows peripheral lymphocytes labeled with α-LIFR. Fluorescent labeling of cells was analyzed using FACS analysis. Data were acquired from 10,000 gated events per sample. To confirm activation of OSMRβ, HPMCs were stimulated with 10 ng/ml OSM for 30 min. Cell lysates were prepared and coimmunoprecipitation techniques used to examine the phosphorylation of gp130 and OSMRβ (Fig. 3⇓A). Immunoprecipitation of gp130, followed by Western blot analysis with anti-phosphotyrosine Abs (PY-20 and 4G10 mixture) identified two bands of ∼130 and 160 kDa, suggesting heterodimerization of gp130 with the OSMRβ. To identify each component, blots were stripped and reprobed with either an anti-gp130 Ab or a monoclonal anti-OSMRβ Ab. 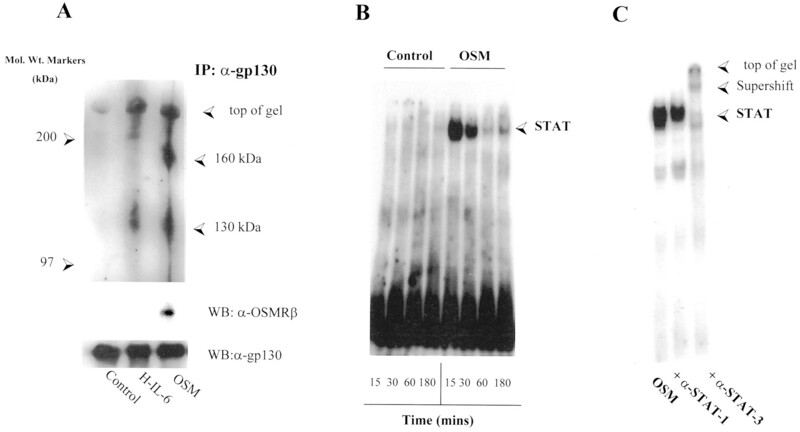 Although gp130 was detected in all cellular extracts, OSMRβ was only observed in OSM-stimulated lysates. Control stimulations using the IL-6-sIL-6R fusion protein HYPER-IL-6 resulted in the detection of a single 130-kDa band (Fig. 3⇓A). EMSAs confirmed activation of STAT by OSM (Fig. 3⇓B), and showed that OSM preferentially induced STAT3, but not STAT1, activation in nuclear extracts derived from HPMCs (Fig. 3⇓C). OSM mechanism of action in HPMCs. A, gp130-immunoprecipitated membrane proteins, previously extracted from HPMCs incubated either with medium alone, 50 ng/ml HYPERIL-6, or 10 ng/ml OSM for 30 min, were separated by SDS-PAGE and transferred to Hybond-P. Using Western blot analysis, membranes were probed for phosphotyrosine, OSMRβ, and gp130 using specific Abs. Data represent the sum of four individual experiments. B, Nuclear extracts were isolated from HPMCs previously incubated in the absence or presence of 10 ng/ml OSM for 15, 30, 60, or 180 min. A double-stranded consensus sequence for STAT (SIE m67) binding was radiolabeled and incubated with the nuclear extract. Protein-DNA interactions were analyzed on a 6% polyacrylamide gel by electrophoresis and bands visualized by autoradiography. C, Nuclear proteins extracted from HPMCs stimulated with OSM (10 ng/ml) for 15 min were assessed by supershift using Abs directed against STAT-3 or STAT-1. Data are representative of two independent experiments. OSM stimulated a dose- and time-dependent release of CCL2 and IL-6 from HPMCs (Fig. 4⇓). Although optimal induction of CCL2 and IL-6 was observed with 10 ng/ml OSM, the time course of their secretion was distinct (Fig. 4⇓, A and C). Maximal expression of CCL2 was observed 8 h after stimulation, whereas IL-6 levels gradually increased over the 24-h assay period (Fig. 4⇓, B and D). In contrast, no expression of CXCL8 (IL-8), CXCL10 (IFN-γ-inducible protein of 10 kDa), CCL3 (macrophage-inflammatory protein-1α), or CCL5 (RANTES) was observed following stimulation with OSM (Table I⇓). OSM induced cytokine expression in HPMCs. A and C, Growth-arrested HPMCs were stimulated for 24 h with increasing concentrations of OSM (0.01–50 ng/ml). B and D, HPMCs were stimulated with either PBS (○) or 1 ng/ml (B) or 3 ng/ml (D) OSM (•) for specified times. ELISA measured CCL2 (A and B) or IL-6 (C and D) concentrations in the collected supernatant. Results are the mean ± SEM of five separate experiments. The specificity of the OSM response was next determined using specific neutralizing Abs against the receptor components. 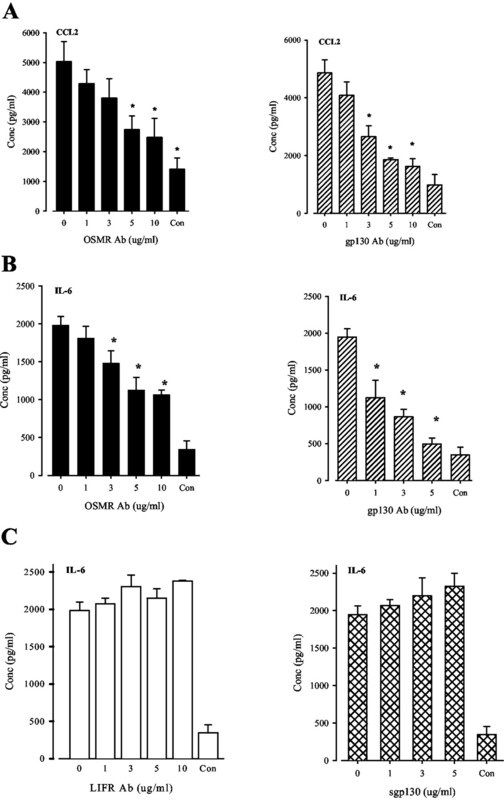 Coincubation of HPMC with OSM together with either anti-OSMRβ or anti-gp130 Abs resulted in a concentration-dependent blockade of OSM-induced CCL2 and IL-6 (Fig. 5⇓, A and B) expression (anti-OSMRβ: 80% for CCL2 and 65% for IL-6; anti-gp130: 80% for CCL2 and 95% for IL-6). Inclusion of a neutralizing LIFR Ab had no effect on IL-6 (Fig. 5⇓C) or CCL2 (data not shown) expression. None of the Abs used influenced the basal mesothelial release of CCL2 and IL-6 (data not shown). Consistent with the low affinity of OSM for soluble gp130 (sgp130; Ref. 24), addition of this naturally occurring antagonist had no affect on OSM-induced IL-6 (Fig. 5⇓C) or CCL2 (data not shown) secretion by HPMCs. Specificity of OSM-induced cytokine expression in HPMCs. Increasing concentrations (1–10 μg/ml) of OSMRβ blocking Ab (▪) or 1–10 μg/ml neutralizing gp130 Ab (▨) were incubated with growth-arrested HPMCs for 24 h in the presence of either 1 ng/ml (A) or 3 ng/ml (B) of OSM. ELISA measured CCL2 (A) or IL-6 (B) in the supernatants. Results are the mean ± SEM of five separate experiments, where ∗, p < 0.01 represents a significant inhibition in both OSM-induced CCL2 or IL-6 expression. C, A total of 1–10 μg/ml LIFR Ab (□) or 1–5 μg/ml sgp130 (▩) were incubated with HPMCs in the presence of 3 ng/ml OSM and IL-6 was measured in the supernatant after 24 h. Results are the mean ± SEM of four separate experiments. The inflammatory response initiated during acute bacterial peritonitis is primarily driven by the proinflammatory cytokines IL-1 and TNF-α (14, 25). Interestingly, increases in i.p. IL-1 (25) coincide with increases in OSM. Consequently, we examined whether OSM affects IL-1-induced gene expression. Using a suboptimal dose of IL-1β (1 pg/ml) for activation of HPMCs (18, 26), experiments examined the effect of OSM on IL-1β-stimulated release of CCL2 and IL-6 (Fig. 6⇓A). Costimulation of HPMCs with IL-1β and OSM significantly elevated CCL2 and IL-6 secretion in a marginally synergistic manner. In contrast, IL-1β-induced expression of CXCL8 was blocked in a dose-dependent manner by OSM, with 10 ng/ml OSM showing an 80% inhibition of CXCL8 release (Fig. 6⇓B). Blockade of CXCL8 by OSM was specific for this neutrophil-activating chemokine because OSM had no affect on IL-1β-induced secretion of CCL5 and CXCL10 (data not shown). Effect of OSM on IL-1β-induced cytokine expression in HPMCs. A, OSM (0.01–10 ng/ml) was incubated with growth-arrested HPMCs for 24 h in the absence (○) or presence (•) of 1 pg/ml IL-1β. ELISAs were used to measure the concentrations of CCL2 or IL-6. Results are the mean ± SEM of four separate experiments where ∗, p < 0.01 represents a significant increase in OSM-induced CCL2 and IL-6 expression in the presence of IL-1β. B, CXCL8 expression was measured in the supernatant in response to OSM (1–50 ng/ml) incubation with growth-arrested HPMCs in the absence (○) or presence (•) of 10 pg/ml IL-1β for 24 h. Results are the mean ± SEM of five separate experiments, where ∗, p < 0.01 represents a significant suppression by OSM on IL-1β-induced CXCL8 expression. Through analysis of sIL-6R and OSM levels in peritoneal dialysis fluid from infected individuals, it is evident that on day 1 of bacterial peritonitis, OSM concentrations show a strong correlation (r = 0.8, p < 0.01) with those of sIL-6R (Fig. 7⇓A). Indeed, the effect of OSM on IL-1β-mediated release of CCL2 and, in particular, CXCL8 expression is similar to the action of the IL-6/sIL-6R complex (17). Consequently, we investigated the potential interaction between OSM and the sIL-6R/IL-6 complex in coregulating CCL2 and CXCL8 expression. The sIL-6R occurs as two distinct isoforms, which are released via proteolytic cleavage of the cognate IL-6R (PC-sIL-6R) and differential mRNA splicing (DS-sIL-6R) (27). However, neutrophils do not release DS-sIL-6R (28). Fig. 7⇓, B and C shows the effect of OSM on PC-sIL-6R-mediated signaling. Stimulation of HPMCs with a suboptimal dose of PC-sIL-6R (10 ng/ml) and IL-6 (10 ng/ml) induced a small but significant increase in CCL2 expression, which when added in combination with OSM caused an accumulative production of CCL2 (Fig. 7⇓B). In contrast, OSM acted synergistically with the sIL-6R to enhance inhibition of IL-1β-induced CXCL8 expression (Fig. 7⇓C). Indeed, when OSM was added in combination with PC-sIL-6R/IL-6, inhibition of CXCL8 secretion was significantly (p < 0.01) greater than the effect observed upon individual stimulation. Similar regulation of CCL2 and CXCL8 was observed if recombinant DS-sIL-6R was used (data not shown). Thus, release of OSM and sIL-6R from infiltrating neutrophils may suppress neutrophil-activating chemokine expression and ultimately block neutrophil recruitment. Modulation of cytokine expression in HPMCs by OSM and IL-6. A, Correlation between OSM and sIL-6R levels measured on the first day of peritonitis. The MINITAB statistical analysis package was used to analyze the regression fit (∗, p < 0.01). B, Growth-arrested HPMCs were incubated with increase concentration (0.01–1 ng/ml) OSM alone (▿) or in the presence 10 ng/ml IL-6 (•), or 10 ng/ml PC-sIL-6R plus 10 ng/ml IL-6 (▪) for 24 h. CCL2 expression was assessed by ELISA. Results are the mean ± SEM of five separate experiments, where ∗, p < 0.01 represents a significant increase in OSM-induced CCL2 expression in the presence of PC-sIL-6R plus IL-6. C, IL-1β (10 pg/ml) was incubated in the absence (□) or presence of 1 ng/ml OSM (▪) with growth-arrested HPMC for 24 h alone or together with 10 ng/ml IL-6 ± 10 ng/ml PC-sIL-6R. Results are the mean ± SEM of five separate experiments, where ∗, p < 0.01 shows a significant suppression of OSM on IL-1β-induced CXCL8 expression in the presence of PC-sIL-6R plus IL-6. Although OSM was originally identified as an inhibitor of tumor cell growth, it is increasingly apparent that this cytokine is also an important inflammatory mediator. The findings presented in this current report demonstrate that OSM released from infiltrating neutrophils is important in the regulation of acute inflammation. Analysis of peritoneal effluent from dialysis patients with clinical peritonitis showed that concentrations of OSM were elevated within the first 24 h of infection and directly correlated with the degree of neutrophil infiltration. Neutrophils have previously been shown to produce OSM in response to inflammatory mediators (13, 29, 30), and consistent with these reports, the infiltrating neutrophil population was identified as the primary source of OSM. Although others have characterized mononuclear leukocytes as being major OSM producers (5, 6, 31), resident peritoneal macrophages were found not to secrete OSM, while detection of OSM in bacterial peritonitis did not coincide with the infiltration of mononuclear leukocytes (days 3–4; Ref. 17). These contradictory findings may reflect a differential action for OSM in acute and chronic inflammatory conditions, since OSM release by mononuclear leukocytes has been observed in more progressive clinical disorders (6, 31). The extremely rapid and transient profile of OSM expression during episodes of bacterial infection is striking, and emphasizes that its biological activities must be tightly regulated. Expression of the cognate OSMRβ was confined to mesothelial cells, and was not detected on neutrophils or mononuclear leukocytes. Consequently, mesothelial cells are likely to be the primary responders to OSM within the peritoneal cavity, and stimulation of HPMCs by OSM resulted in the phosphorylation of a gp130/OSMRβ heterodimer, and activation of STAT3. However, it remains unclear what in vivo regulatory processes control the action of OSM. Previous studies have emphasized that the naturally occurring antagonist sgp130 can inhibit OSM signaling. sgp130 is present at ∼250 ng/ml in human plasma and its activity has been shown to influence neutrophil recruitment (17) and to suppress development of colitis (32). However, sgp130 concentrations known to inhibit sIL-6R-mediated signaling did not affect OSM-induced cytokine expression. This may be related to the apparent low affinity of OSM for sgp130 (24). Thus, blockade of OSM signaling in vivo may require more specialized mechanisms, such as down-regulation of the OSMRβ (33) or the generation of a soluble antagonistic form of the OSM receptor. To date, no such soluble receptor has been identified. OSM stimulated the secretion of CCL2 and IL-6 by HPMCs; however, time-course analyses showed a burst of CCL2 release that was maximal following a 6-h stimulation with OSM. In contrast, IL-6 secretion increased gradually over time. These differences were specific for OSM, since Abs directed against gp130 and OSMRβ selectively blocked the induction of both mediators. A similar pattern of IL-6 secretion has also been reported in U373 astrocytes, where the authors speculated that IL-6 transcription might require two regulatory processes (12). Appropriate control of leukocyte recruitment from an initial neutrophil influx to a more sustained population of mononuclear leukocytes is an underlining feature in the resolution of inflammatory conditions such as peritonitis (16, 34). Using a series in vitro and in vivo approaches, we have recently defined roles for IFN-γ (26), IL-6, and sIL-6R (17) in the control of this critical step. The data presented in this study suggest that OSM may directly or indirectly contribute to the regulation of this event. Through direct activation of the mesothelium, OSM has the capacity to induce CCL2 expression and to inhibit proinflammatory cytokine activation of CXCL8. Thus, OSM may contribute to the cessation of neutrophil recruitment and concurrent attraction of mononuclear leukocytes. This is also emphasized by the synergistic inhibition of IL-1β-induced CXCL8 expression by OSM and the sIL-6R/IL-6 complex, while the secretion of IL-6 in response to OSM might further contribute to the control of leukocyte recruitment by sIL-6R. Because modulation of chemokine secretion in response to OSM has been reported in other cell types (8, 9, 10, 11, 12), it is conceivable that this model of events may be applicable to other inflammatory conditions. This study demonstrates that OSM performs an important regulatory role during acute inflammation. OSM may be included in an increasing list of mediators that are released from the infiltrating neutrophils so as to suppress neutrophil attraction (e.g., L-selectin and sIL-6R), and as is the case for the IL-6/sIL-6R complex, promote recruitment of mononuclear leukocytes. Ultimately, regulation of these neutrophil-derived mediators might be central to orchestrating the transition of innate to acquired immunity seen in various inflammatory settings. We thank Prof. Stefan Rose-John for his kind gift of HYPER-IL-6, and the staff of the CAPD unit, University Hospital of Wales, for facilitating collection of peritoneal effluent. ↵1 This work was funded by Wellcome Trust Project Grants 058297/2/99/Z and 065961/Z/01/Z (to N.T. and S.A.J.). ↵3 Abbreviations used in this paper: OSM, oncostatin M; CAPD, continuous ambulatory peritonitis dialysis; sIL-6R, soluble IL-6R; sgp130, soluble gp130; LIF, leukemia inhibitory factor; CXCL, CXC chemokine ligand; CCL, CC chemokine ligand; OSMRβ, OSM receptor β; HPMC, human peritoneal mesothelial cell. Cross, A., R. J. Moots, R. C. Bucknall, and S. W. Edwards. 2002. Oncostatin M production by synovial fluid neutrophils. In Rheumatology XIXth Annual Meeting, April 23–26. Brighton, U.K., 41:27 (Abstr. 4).